Action Fence Action Fence has installed chain link fence projects in every size and level of complexity for both residences and commercial properties in the Tennessee and Georgia region. This has included ball parks, prisons, and our always popular residential chain link fences. Chain-links are a type of fence that is woven together in a zig-zag pattern, giving them an immense strength and high security factor. Plus, you might not realize it but they can greatly vary in height, pattern, and overall look. This is accomplished through material choice, finish or coating choice, coating thickness, and pattern of woven materials. With a few modifications, we can even give this product a high sense of privacy you might not have realized was possible. We can use a variety of coatings to meet your budget and design needs, and can build to heights varying from as little as 4 feet to as tall as 12 feet or taller for custom fences. A neat trick we often suggest to save you big money on fence projects, while still allowing for more aesthetically pleasing fence form factors, is to to combine the security of chain link fence with beautiful vinyl fence or nature inspired wooden fence. Ask our sales reps for more information. Please check out our collection of ornamental commercial aluminum and residential fences to spark your imagination. 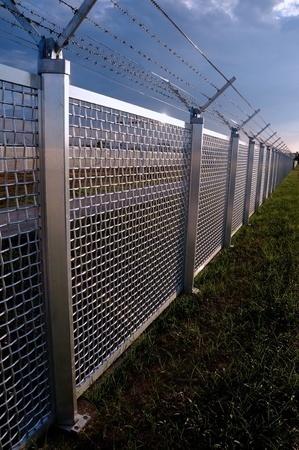 When additional security is necessary, we can install barbed wire on top of your fence. Additionally, the inclusion of razor ribbon, spiraled around the group of strands and run down along side can be placed on fences eight feet and higher. Action Fence also can include entry and exit gateways, as well as driveway gates. These options include keypad systems, gate operators keypads, and telephone entry technology. Give us a call today at 423-842-8700. How deep do fence posts need to be in the ground? How much does it cost to install a chain link fence? How much does it cost to put up a chain link fence? What is the standard distance between chain link fence posts?